Traffic came to a standstill during rush hour in Beijing on Wednesday as a massive sandstorm covered the Chinese capital in thick blanket of red dust, making internet users speak about the end of the world. The China Meteorological Administration issued a yellow sandstorm alert – the third-most serious danger level – warning about a drop in visibility to less than 1,000 meters and increased air pollution. Some areas in the city of 21 million recorded air pollution of nearly 1,000 micrograms per cubic meter, which is considered hazardous for people’s health. Beijing residents had to wear face masks and goggles to protect themselves from the red sand and avoid injury and respiratory problems. The bad visibility seriously disrupted traffic, causing large traffic jams all over the capital. Chinese internet users were quick to label the weather phenomenon ‘Sand-ageddon,’ comparing it to the end of the world. “It’s very dirty, I feel like it is the end of the world,” one of the users was cited by South China Morning Post. 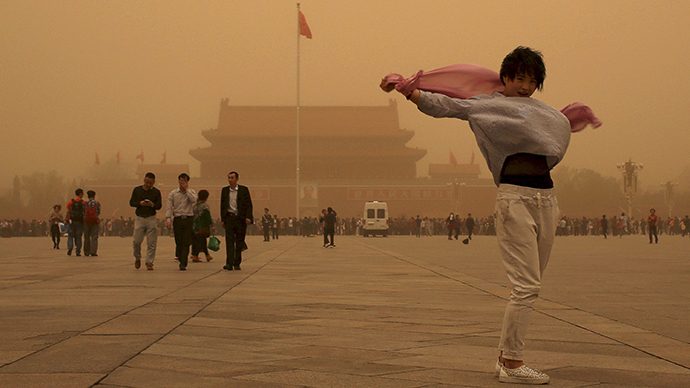 Despite being far from the red danger level, Wednesday’s sand storm was the strongest in the Chinese capital in 13 years. Besides Beijing, 11 other provinces in the north of the country were impacted by the storm, which led to electricity blackouts and chaos on the roads. Sandstorms are a common event in China in the spring, with the dust originating from the outer edge of deserts in Mongolia, northern China and the Hexi Corridor. Beijing is considered among the most polluted cities in the planet, with environmental watchdog Chinese Hazardous saying on Thursday that air particles, which cause asthma and breathing problems, were more than double the national target in the capital.